The Villa is accessed by a private gate that leads to a large open space, surrounded by flowerbeds of hydrangeas and roses, in front of the porch of the house with a view over the vineyard. The private swimming pool (m15x7) is located in the garden at the back of the Villa. On the ground floor, overlooking the portico and the back garden, there are the large living room, the library, the dining rooms and two sitting rooms / study. The premises are elegantly furnished with antique furniture, bookcases and a piano and equipped with large fireplaces. It completes a large kitchen equipped with all crockery, pots, cutlery, glasses and appliances such as dishwasher, toaster, coffee machine etc necessary to prepare any meal for all guests of the house. Finally, a laundry room equipped with a washing machine, iron and ironing board, and a service bedroom with its bathroom. On the first floor of the Villa there is the sleeping area consisting of three double bedrooms and two double bedrooms with twin beds. Between these 5 bedrooms, two are equipped with an adjoining sitting room with a further sofa bed, reaching a total of 12 beds. The bathrooms are 4 which can be accessed from the corridors. On the second floor there are another 4 bedrooms and two bathrooms, reaching a total of 8 beds. All rooms and bathrooms are complete with linen. The villa is an ideal place for both holiday stays (not less than a week) and business stays (not less than three nights from June to October and five nights from November to May). It can also be a comfortable and pleasant solution for those who, not being able to get away from Milan in the summer can stay with family or friends and reach them daily in less than an hour. For families with children there are numerous sports activities in the surrounding area (golf course, bike rental, two lakes for swimming, trekking, etc.) and numerous playgrounds such as Gardaland etc. Ideal for groups during the Grand Prix of Formula One. For music lovers, we mention the famous Arena di Verona where the famous opera festival and Parma with the Verdi festival take place every year between the end of June and the beginning of September between the end of September and the end of October. Connected through the highway you reach Milan in less than an hour. For art trips you can reach Bergamo and Brescia in about 20 minutes, Verona, Mantua and Parma in about an hour, Padua and Vicenza in an hour and a half, Lake Garda in 30 minutes, Lake Iseo in a quarter of an hour and Lake Como in about an hour and a half, Venice in less than two hours. This is a fantistic house and the surroundings are beautiful. 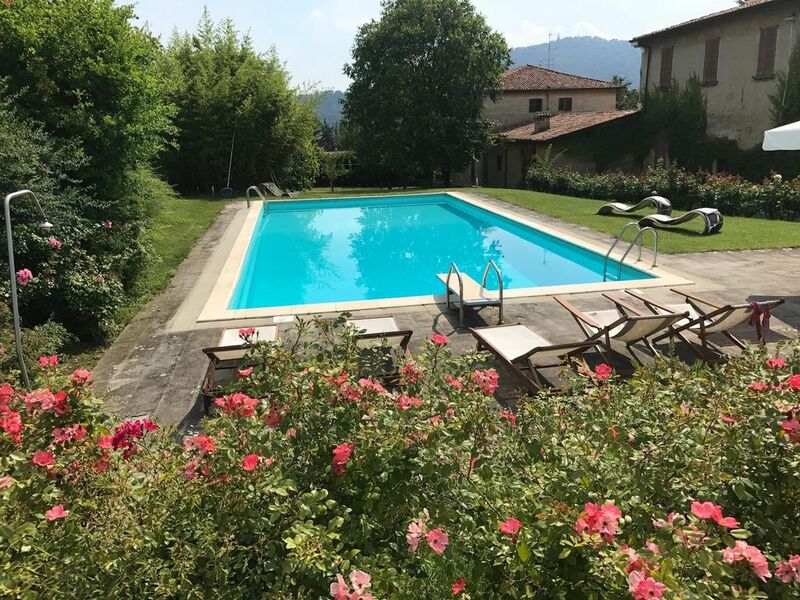 Convenient distance from Bergamo Milano airport and close to both vineyards and lake Iseo. I would recommend to rent bikes from Nicola at Franciacorta biketour. Rosella and Barbara were kind and very helpful. All in all, we had an amazing weekend that we will never forget. Andreas and his friends were wonderful guests! We really wish to welcome them again soon!! Agréable séjour familial (12 personnes) dans cette jolie villa spacieuse et bien située. Accueil chaleureux de la part de Daniele qui est toujours disponible. Nous avons beaucoup apprécié la belle et grande maison de Madame Milesi. L’accueil a été extrêmement chaleureux : après avoir bu le verre de l’amitié, nous avons été ravis, après une longue journée de voyage, d’ avoir un plat préparé pour dix ! Daniele, le gardien, est un homme précieux qui a toujours été disponible si l’ on rencontrait le moindre problème. La maison est très bien située pour visiter les villes de la région et les lacs d’Iseo et de Garde. Erbusco is immersed in a countryside context but connected optimally to the most important cities of Lombardy and Veneto such as Milan, Venice, Verona, etc.